Evaluation of advanced ATM (Air Traffic Management) concepts, techniques, methods, technologies and assessment of state-of-the-art aircraft equipment compliance with advanced ATM concepts and technologies. Controller-pilot data link communications (CPDLC) optimization. New AMAN (arrival management)/DAMAN (departure management) procedures and technologies simulation. 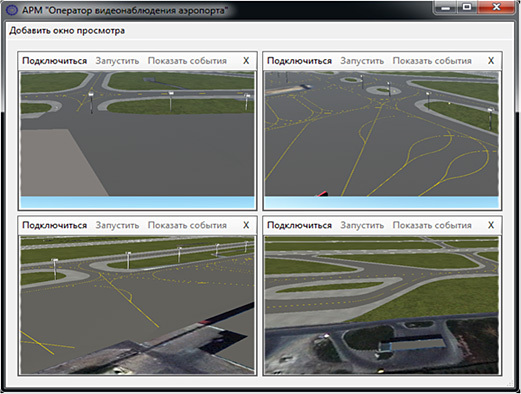 Airfield surface movement guidance and control system (ASMGCS) simulation. Air traffic flow management and planning algorithms refinement (ATFMP). Dynamic models implement a distributed computing method. This guarantees the independent system logic. Dynamic model computation process is synchronized by UTS. A common database is used. The concept is in some ways similar to SWIM (system wide integrity management) data-sharing concept. Simulation process control and synchronization are provided by a message dispatcher both in real-time and fast-time scale. All aeronautical data, aircraft data, air traffic flow data is stored in scenario libraries of a common database. At simulation initialization stage this information is copied into operational tables, and all applications – simulator components – refer to these tables. Initialization signal is transmitted via TCP/IP (transmission control protocol/internet protocol). During the simulation process all models and simulators exchange status-change data via TCP/IP protocol. During the simulation process all flight (track) data and system event data is stored in the database, in the form of tables specially designed for simulation data logging. 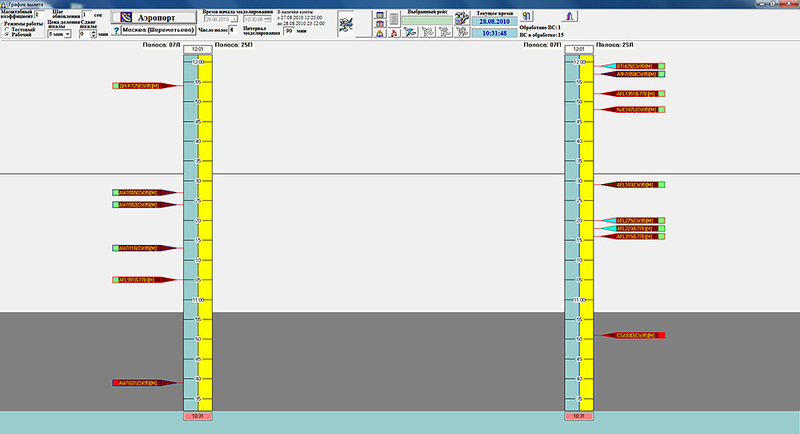 After completion of simulation process the logged data is archived and is available for post-flight analysis. Experiment management workstation (EMW) - presimulation preparation (scenario preparation), simulation work, subsystem data exchange support, simulation data analysis, report generation. EMW is a core element of the whole IATCSHLS system. EMW software serves as an integrator for the entire simulator, acting as an arbiter, controlling the simulation progress and providing data exchange between all simulator components. EMW user interface (experiment preparation and carrying out, simulation data analysis) – ”Experiment management” software tool. EMW software includes a set of different software tools, both fully automatic and using man-machine interface. With the help of these tools the EMW operator can generate different sets of raw data used by simulator components and then use these data sets for a specific experiment. 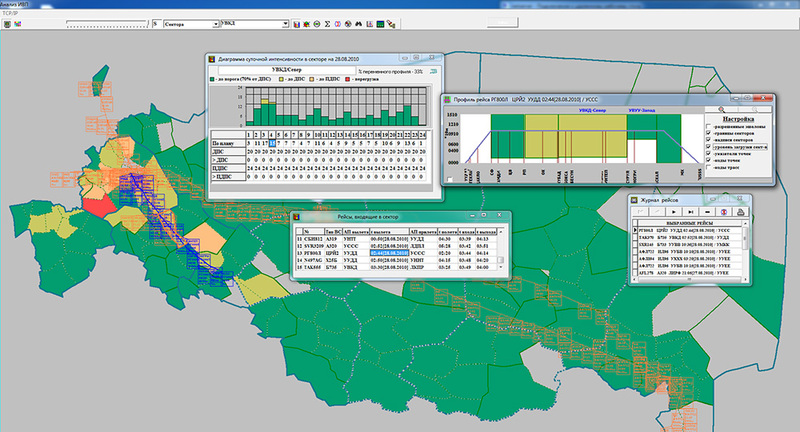 During the simulation session the EMW software allows to monitor the progress of work and direct it using data, received from other sources, including graphic information displayed in various visualization systems. Besides, the software package includes simulation data logging and processing tools for follow-on analysis. EMW user interface (experiment progress monitoring) – “air situation visualization” software tool. 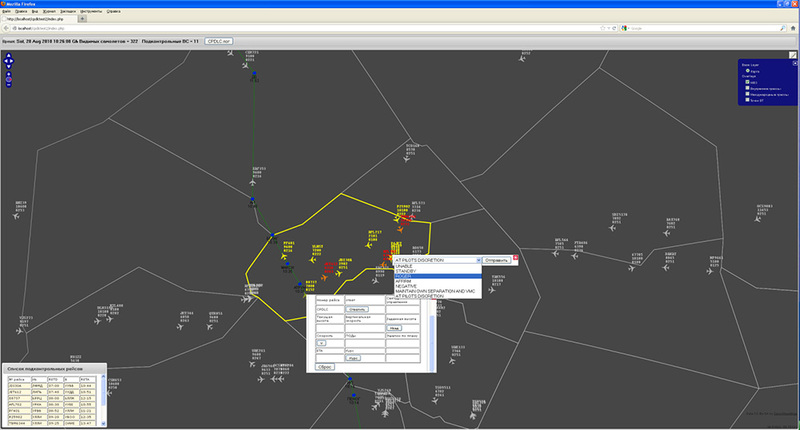 The figure shows ground surveillance system data, a selected flight planned route and thunderstorm clouds position. 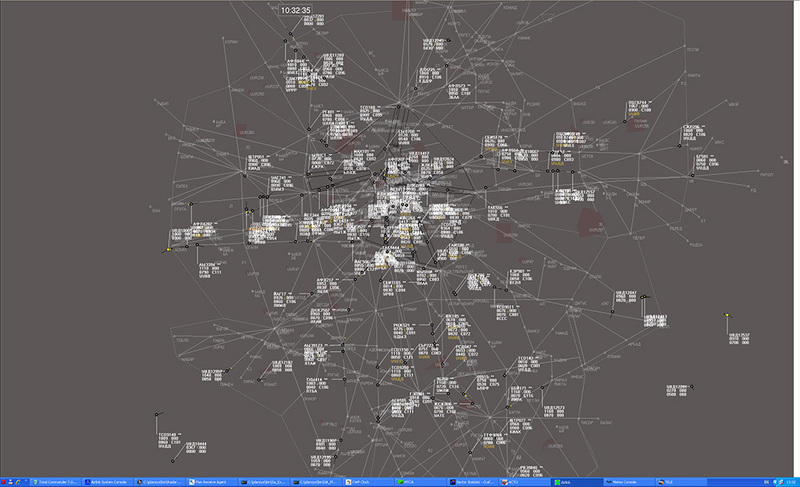 EMW user interface (experiment progress monitoring) - “3D air situation visualization” software tool. 3D air situation visualization. 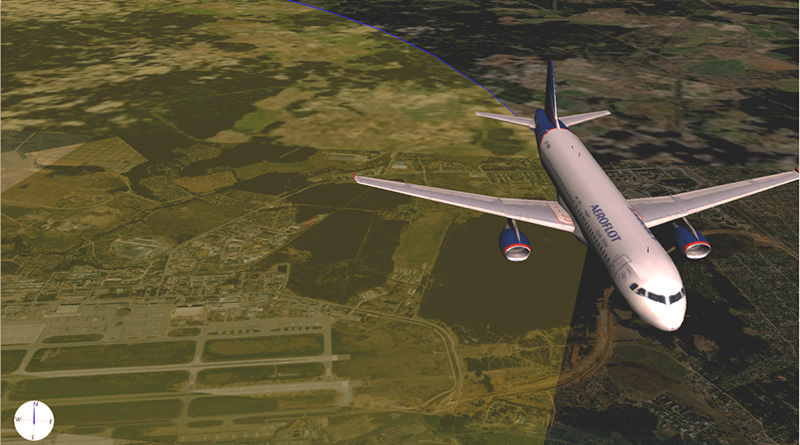 Flight over Sheremetyevo airport. 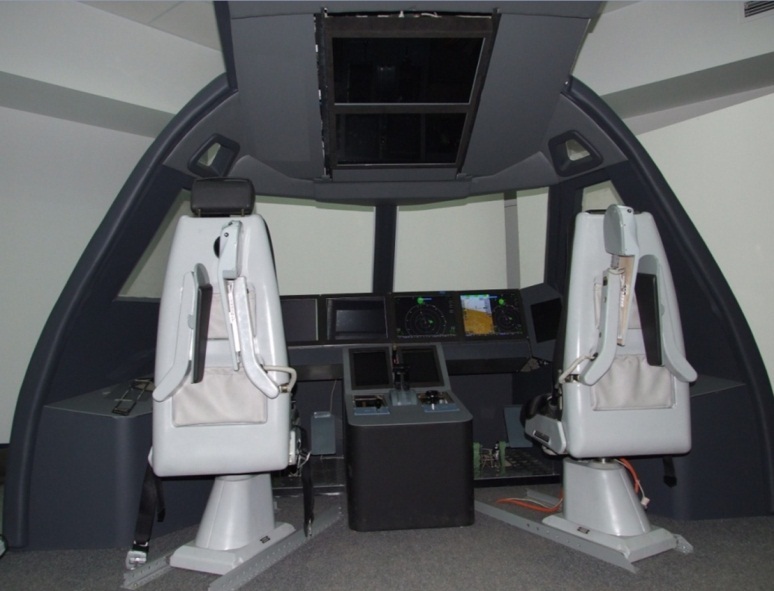 Advanced aircraft cockpit simulator – at present IATCSHILS features three cockpit simulators: 1) cockpit simulator developed by FGUP GosNIIAS and FGUP Flight Research Center; 2) MC-21 cockpit simulator developed by FGUP GosNIIAS; 3) FGUP TsAGI cockpit simulator. FGUP Flight Research Center has developed and implemented in civil aircraft cockpit demonstrator new cockpit instrumentation and avionics prototypes. Unified data display and input methods comply with intuitive algorithm of aircrew activity at various stages of flight. Cockpit simulators feature instrumentation, flight and navigation, and avionics touch screen control, as well as remote cursor control, data input and voice control. IATCSHLS aircraft prototyping facility is designed for pilot-in-the-loop aircraft flight simulation for advanced cockpit hardware/software system development. The simulator allows generating and updating a flight plan. All flight stages can be simulated: airfield taxiing, take-off, climb, en-route cruise flight, descent and landing. CPDLC channel and traditional voice communications are used for pilot-controller data exchange. At present FGUP GosNIIAS MC-21 and FGUP TsAGI cockpits integration is completed. ATC controller workstation uses the software of MK-2000 redundant ATC system, installed in the Moscow regional center. The updated version includes advanced controller functions (CPDLC, MONA (modular navigation), receipt of self separation requests, rerouting etc.). MK-2000 ATC controller workstation user interface. provision of agreed volume of information on air traffic situation to other airspace users and interested parties. Upgraded software ATC workstation user interface. For cockpit simulator operation as part of the IATCSHILS its software is configured to allow cockpit simulator automated mode operation under the EMW control. ATC workstation. Right – “Kamerton” voice communication system. 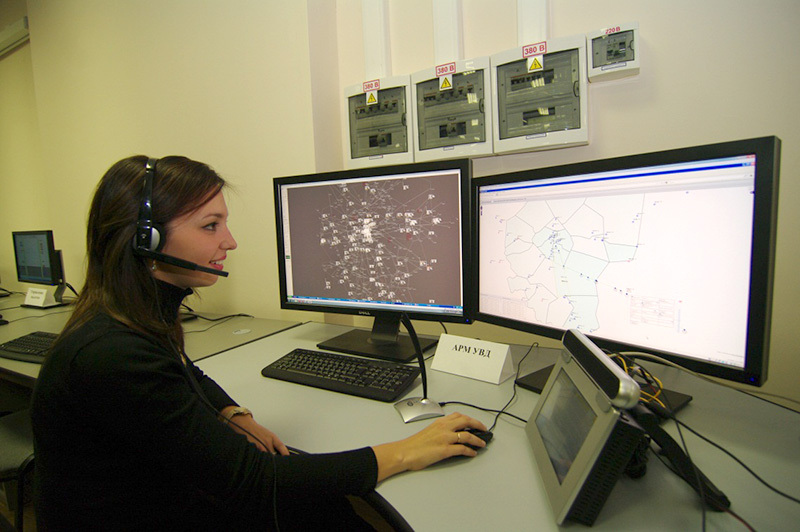 ATC workstation uses the software of MK-2000 redundant ATC system, installed in the Moscow regional center. The updated version includes advanced controller functions (CPDLC, MONA (modular navigation), receipt of self separation requests, rerouting etc.). AMAN (Arrival management) workstation allows to simulate arrival controller operations and to generate data on regulatory actions for air traffic controllers. AMAN workstation software simulates the process of aircraft arrival scheduling by a planning controller. AMAN workstation is intended for air traffic study in the ATM “bottleneck” – in the airport area and on the airfield itself. AMAN workstation planning controller operation simulation consists in arriving aircraft flow scheduling simulation: based on actual planning data arriving aircraft conflict situations (separation rules violation) in the airport area and during runway landing are predicted, manually or automatically conflict management techniques are worked out for the aircraft (flight plan change) and proposed management techniques coordination is carried out: the AMAN workstation controller must coordinate the proposed techniques with air traffic controller who, in his turn, coordinates them with the aircrew. In case of a proposed technique acceptance air traffic controller forwards this information to the central planning system for this aircraft flight plan updating. The proposed technology for the most part complies with current foreign solutions. For some years major airports (e.g. in London and Frankfurt) use decision making support software for arriving aircraft management. AMAN workstation user interface (AMAN software tool). The characteristic feature of the system is the availability of automatic optimization procedure that allows obtaining conflict-free variants of arriving aircraft flows in the automatic mode. In this case optimization problem solution algorithms are used, allowing to find solutions more close to the global optimum as compared to techniques used in the majority of similar foreign systems (e.g. FIFO: first in – first out). air traffic controller assistance in arriving aircraft flow management. aircraft arrival management efficiency assessment for different control schemes. DMAN (Departure management) workstation - allows to simulate departure controller operations and to generate data on regulatory actions for air traffic controllers. 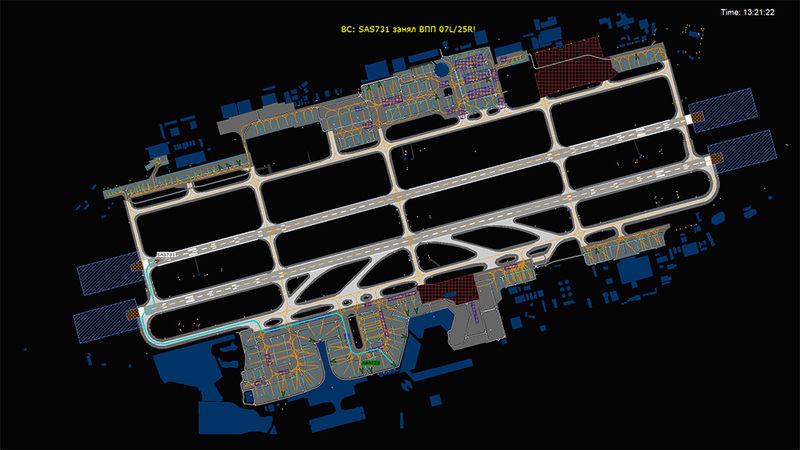 DMAN workstation software simulates the process of aircraft departure scheduling by a planning controller. DMAN workstation is intended for air traffic study in the ATM “bottleneck” – in the airport area and on the airfield itself. DMAN workstation planning controller operation simulation consists in departing aircraft flow scheduling simulation: based on actual planning data possible separation regulations violations during runway takeoff and in the airport area are predicted, manually or automatically regulation decisions are worked out (flight plan change) and proposed management decisions are coordinated with a lineup controller; and after successful coordination this information is forwarded to the central planning system for this aircraft flight plan updating. The proposed technology for the most part complies with current foreign solutions. For some years major airports (e.g. in Paris) use decision making support software for departing aircraft flow management. DMAN workstation user interface (“DMAN” software tool). The proposed DMAN simulator features the automatic optimization procedure that allows to obtain conflict-free variants of departing aircraft flows in the automatic mode while using optimization problem solution algorithms, allowing to find solutions more close to the global optimum as compared to techniques used in the majority of similar foreign systems (e.g. FIFO: first in – first out). air traffic controller assistance in departing aircraft flow management. CFMU (Central Flow Management Unit) simulator, ATFM (air traffic flow management) controller workstation - simulates the central planning unit which is the analogue of RF UATMS (Unified ATM System) Main Air Traffic Management Center and Eurocontrol CFMU. Hardware/software system simulates centralized air traffic planning processes and the interaction with other interested parties of air traffic control and planning process. 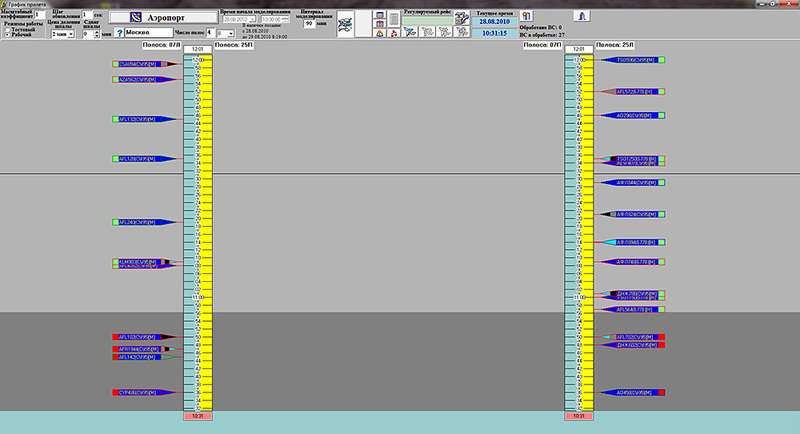 ATFM (air traffic flow management) controller workstation user interface (“Air traffic load analysis” software tool). the provision of actual planning information to all airspace users. The automated simulation of the planning center features the simulation of both automatic calculations and planning controller functions on a dedicated workstation. 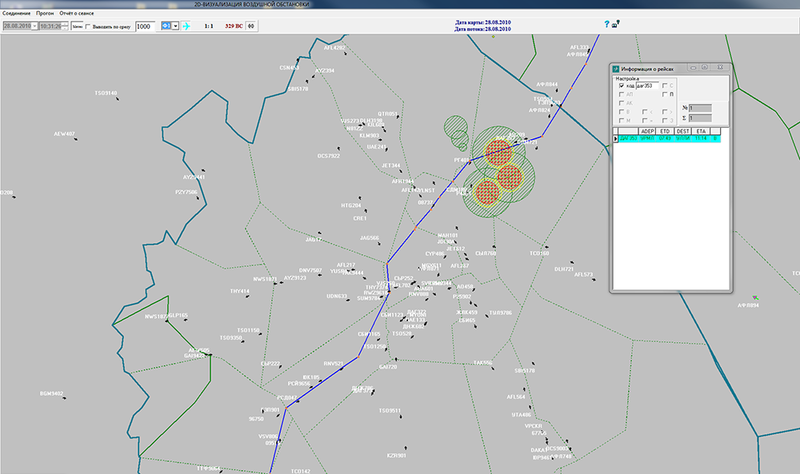 The automated simulation of the planning center features the simulation of both automatic calculations and planning controller functions on a dedicated workstation ATFM controller workstation software includes intelligent controller monitoring and decision making support tools as well as information tools supporting the interaction with other airspace users. Automated ATC system simulation model is designed for aircraft on-line monitoring and control in the simulated airspace. It simulates respective RC, approach and airfield controller operations throughout the simulated airspace. Automated ATC system simulation model provides the controller-controlled aircraft flow simulation within IATCSHILS. Aircraft movement model - flight and airfield surface movement modeling. Aircraft model describes a specific aircraft flight. The purpose of each controlled flight consists in fulfilling a daily flight plan by a chosen aircraft of the aircraft flow. airborne navigation system commands for the stabilization system. Stabilization system performance simulation (command simulation dynamics; roll angle, longitudinal and vertical velocity limits). Simulation of navigation errors related to airborne navigation system and its ground components operation, and stabilization system navigation accuracy. Aircrew-controller voice communications failure or breakdown possibility is provided. The controller-aircrew interaction during the controlled flight results in the generation of flight conditions change command in accordance with which a “route table” (a detailed description of programmed aircraft trajectory) is updated. Aircrew-controller radio communication is simulated in the development modeling mode. The model imitates the instrument flight. In addition, an airborne surveillance system can be used (as a component of all or several simulated aircraft) to provide aircrew situational awareness and self-separation capability. Ground surveillance system model - models trajectory data (radar or ADS-B data) acquisition, processing and transfer to the system. The model also imitates meteorological measuring equipment operation. Ground surveillance system and ground communication system (GSS) model imitates the operation of the ground surveillance system providing aircraft position data to the ATC system; operation of the meteorological observation system, providing data on dangerous weather conditions to the ATC system; and ground communications equipment providing aircraft-ATC controller communications. ground communications equipment position data generation. Weather development model - imitates both the atmosphere state (wind force and direction) and adverse weather conditions (thunderstorm clouds). Weather development model is designed for weather dynamics modeling. The software allows modeling the formation and disappearance of thunderstorm clouds of three types. Three types of thunderstorm clouds are simulated: single-cell, multi-cell and super-cell clouds. 3D single-cell thunderstorm cloud model is presented in the form of inverted truncated elliptic paraboloid. 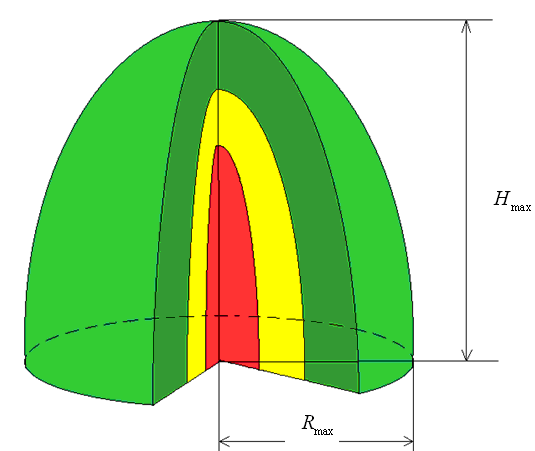 High intensity zone is painted in red, medium intensity zone – in yellow, low intensity zone – in green. A multi-cell thunderstorm cloud is modeled as a superposition of several (from 2 to 8) single-cell clouds. A “super-cell” type cloud is modeled as a single-cell thunder cloud with typical for “super-cell” size. 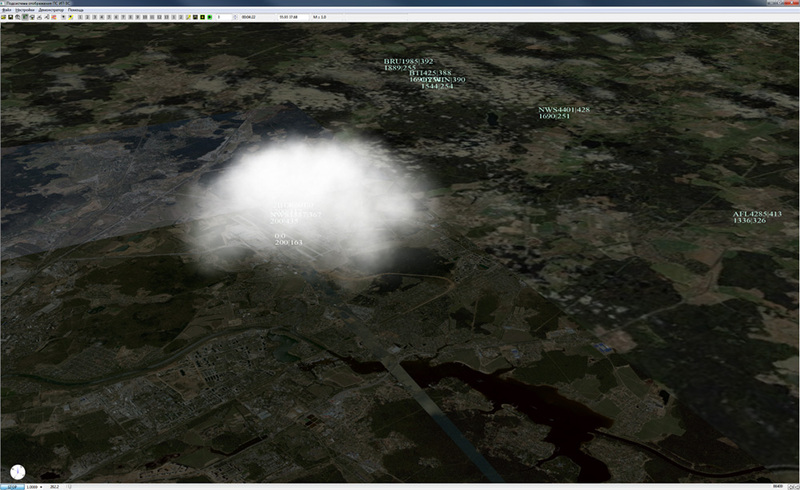 Weather development model 3D single-cell thunderstorm cloud visualization. Air model - models all types of signals (voice, digital messages) propagation through the air in real radio communications environment. continuous mobile receiver/transmitter coordinate variation for real-time estimation of the power of receiver input signals transmitted over a common frequency channel to estimate each aircraft general electromagnetic environment. signal quality – signal-to-interference + noise ratio. The model takes account of VDL-4 (video data link-4) communications for ADS-B messages and VDL-2 for controller-pilot messages (CPDLC messages). “Airfield” simulator - simulates landing, taxiing and take-off processes. It allows imitating both individual aircraft and airfield surface surveillance and airfield surface movement control systems. airborne surveillance and navigation applications development to improve pilot situational awareness. aircraft and ground vehicle data. airfield controlled vehicle movement dynamic simulator. “Virtual tower” 3-D visualization system. Airfield surface movement control workstation – user interface. airfield surface potential conflict situation identification and resolution. Aircraft and ground vehicle movement models are responsible for the imitation of vehicle movement on the airfield surface, and surveillance model imitates aircraft visibility in the airport area and on the airfield surface by airdrome surveillance equipment. It is supplemented by video surveillance model imitating the runway and adjacent territories surveillance by TV cameras and moving object identification in the indicated area. synthetic scene (surveillance model and video surveillance data). Airdrome video surveillance system is designed to enhance aircrew and controller situational awareness of aircraft and ground vehicle movement in the airfield territory. The main task of the model is the analysis of video data from airfield territory surveillance cameras to detect all moving aircraft and vehicles including those which are not equipped with ADS-B sensors. integration of synthesized multi-source (e.g. 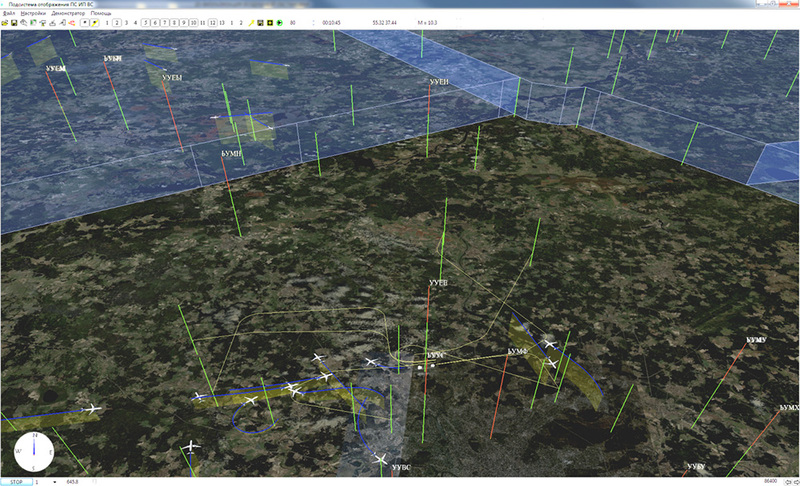 ADS-B sensors) state vector data with video analytics algorithms data. Video data flow with marked detected aircraft and vehicles is transmitted to video surveillance controller workstation, and integrated detected object state vectors are transmitted in real time to the experiment management workstation (EMW), that forwards the data to the advanced aircraft cockpit simulator, to the ground surveillance system simulator and to other IATCSHILS components. Airdrome video surveillance controller workstation user interface.